It was a great night for Breaking Bad at last night Emmy awards 2014 as the highly acclaimed AMC show picked up another Emmy for Outstanding Drama Series. The win is a fitting recognition for a show that recently entered the Guinness Book of Records as the highest rated TV drama of all time. It was a tough category to win this year coming up against strong challenges from shows like True Detective, Game of Thrones and House of Cards. After a very strong final season though, it was always going to be a forerunner in what was the last time it competed. Vicnce Glligan expressed his heartfelt thanks saying "Thank you so much for this farewell to our show. You have been very kind to us indeed." 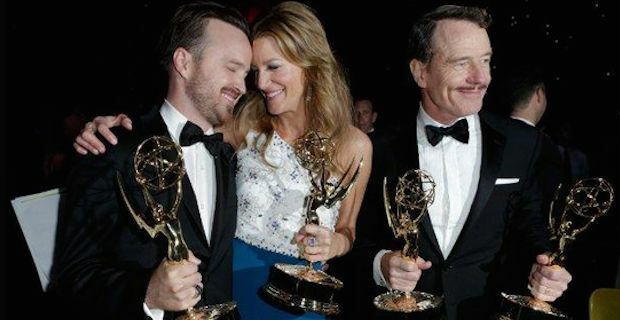 It was also a clean sweep for the show's stars with Bryan Cranston winning Best Actor, Aaron Paul taking Best Supporting Actor and Anna Gunn winning Best Supporting Actress in a drama series. Other notable winners on the night include a Best Comedy award for Modern Family, Julianna Margulies winning Best Actress for her role on The Good Wife and Julia Louis-Dreyfus won Outstanding Lead Actress in a comedy series for HBO's Veep. It wasn't a bad night for British talent either with Sherlock's Steven Moffat picking up Best Writer while the show's stars Benedict Cumberbatch and Martin Freeman also picked up Best Actor and Best Supporting actor in a mini-series, both for the episode His Last Vow. There were plenty of raised eyebrows however when Orange is the New Black left the ceremony empty handed after being expected to do well this year. To leave with no awards will be a big disappointment to all involved in the hit prison series. There was also a very touching and poignant tribute to the late Robin Williams by host Billy Crystal. Crystal struggled to keep his emotions in check as he fondly remembered the comedic tour-de-force through personal stories and memories from occasions he was in Williams' company. He said of Williams "For almost 40 years, he was the brightest star in the comedy galaxy."